The OGDP just ended, and I got my results. I grinded about 23.32 mill and got the OGDP at rank 96 with some other good stuff. I'm surprised that I even made the leader board, considering that I was just a 280k rated fish competing against some 600k or 700k rated whales. 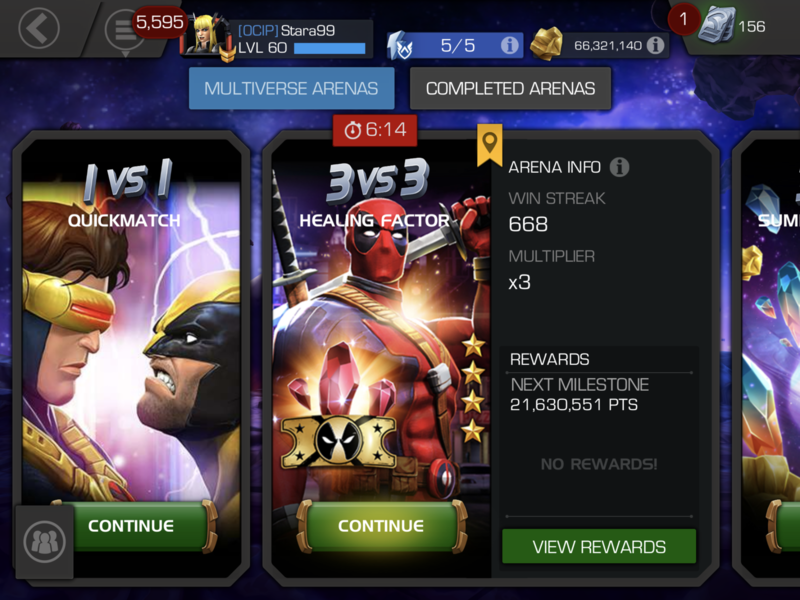 I also won the golden ticket, so I might grind in the GoldPool arena for some nice shards. Did you get OGDP? If you did, then how many points did it take you? If you missed him, then what is your plan on getting him on the next 3 rounds? There are only 600 OGDPs to be won in the arena, so get to grinding quickly! I spent no money, but used 1500 units which I had saved up from grinding. I want a GP, but I don't really have the roster to compete. Good luck. At least you will get good rewards if not goldpool. Yeah, apparently there are going to be some 6 star shards and 5 star shards? I wouldn't mind opening up another 5 star or my first 6 star! BTW, to all the people who don't believe me, go to the recent OGDP arena and scroll down to 96th place, and then search up my name, to confirm. I started 28 hours into the arena Around 5pm eastern on Friday with 0 units spent. Only reason is to get the golden ticket because I’ve had him over 2yrs at 5/50. Spent 5200 units and was lucky to get goldpool once but no golden ticket. Sadly this arena time constraints and the massive points needed doesn't allow for me to even get close. The dates and times would require me to send my daughter on a three day vacation with family AND take three days off from work. So I seriously doubt I will ever get close to needed so not bothering. Can i get some feedback plz? Deadpool OG is the champ i ve most desired in this game, much more than Thanos, Kang.. whatever..
3*s i got 95% of them, all maxed, lots with 99 signature. Problem is the timing of the arena is awful to me, i got loads of university exams this month, and i dont have units to spare and i dont put money on this game. A full round with all my 4*s gives about 800k points and takes 1:30 to 2h (my game is REALLY laggy since last update). To ger to the mark i d have to do like 7m a day, thats crazy considering how laggy this game is and lets get real, arena is RLY boring, but since this arena is like 1 in a lifetime and i got a ticket, im considering trying. And i play in a Iphone 6 btw, but the lagg is not on the fights, its on the menus! It started after last update, i never had laggs in menu, but now i got to restart the game every 30min to normalize, its awful! Is it just me? I should use suicides too then? Which other masteries give a major increase in PI for arena grind? Suicides do increase the points, but the real good thing is that they let you end quicker. If you want to do as many fights as possible before your champs refresh, get a lot of offensive masteries that will make your champs win quicker.